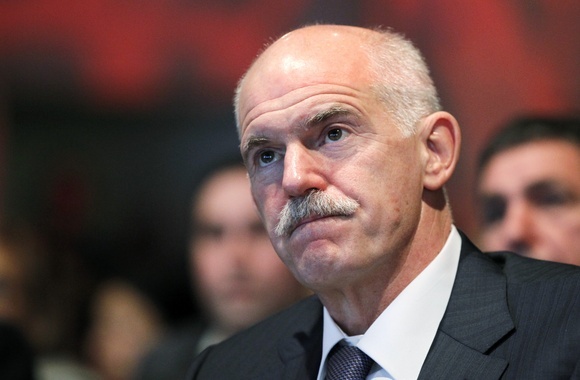 An interview with George Papandreou, former Prime Minister of Greece, about debt, the challenge of structural reform, and governance in a time of crisis. At what point did you realize that your European counterparts, beyond giving Greece money to pay back its debt to them, would take no further measures? The Deauville summit between Merkel and Sarkozy was a clear turning point. Their decision concerning the future European Stability Mechanism (ESM) spooked the markets and creditors. It created a selffulfilling prophecy, as the new ESM would basically punish creditors in the future if they invested in highrisk countries; it pushed them to stop investment or hike the risk premium for these countries in the present. This created fear and it hit Greece first. While we were expecting to access the market in 2012, by May 2011 we all realized the markets were too afraid to invest in countries like Greece. And this had little to do with Greece’s performance. The markets simply did not trust the new system set up for the euro. In fact, what happened after Deauville is that we created a rift in the Eurozone between low and higher risk countries. This divide has been growing ever since and is threatening to tear Europe apart. Up until then, Greece – at least until March 2011 – was the ‘poster boy’: the positive example of our efforts. In fact, Greece had been hailed in Brussels as a model to follow in terms of putting our house in order and making deep structural reforms. Up until then, there had been diligent preparation on behalf of all parties: the Greek government, the Greek people and the Troika. In Greece, the tide was turning in favor of complex issues such as tax collection and the reform agenda for our civil service. But Deauville created fear. Confidence in the market was consistently being eroded, pushed by a populist press full of doomsayers and fear mongers. This wasn’t just happening in Greece, it was happening all over Europe and around the world: Greece was the news every night on every major channel. The morale of the markets as well as the morale of the Greek people was undermined. There was a sense of inevitable failure: our difficult Odyssey suddenly seemed to become a Sisyphean task. But if we look at the facts, Greece had made major changes and improvements in a very short time – to say nothing of the unprecedented reduction of the deficit by 5 percent in one fiscal year. It was, however, quite convenient for some EU members and the Troika to attribute this impasse in the markets solely to a lack of effort on Greece’s part: Greece soon became the easy scapegoat. This further de-legitimized the program among the European public and in the eyes of the Greek public. Not only were Greeks already feeling the pain - now they were also being told that they were failing. The markets, analysts and politicians then began to predict a default or an exit from the euro. Uncertainty is corrosive – more so than austerity. Uncertainty further undermined our efforts. This had profound effects on the economy. Lending, borrowing, consuming and investing simply slowed down almost to a halt. At the same time, people started to worry about their savings in euros and began pulling them out of the banks. This situation continues to the present day. Therefore, a program and a mechanism set up to protect Greece while it was reforming ended up not protecting Greece at all. While we began the program in a climate of optimism – even dynamism – in a Greek society longing for change, we were overtaken by events beyond our control. A proud people making important sacrifices, we were now portrayed as lazy, incompetent and profligate: stereotypes and prejudice reigned rather than cool-headed analysis. This became offensive to the Greek people. It not only harmed the economy, it deepened the recession, and also undercut the acceptance of major reforms such as fighting against tax evasion. All the efforts we had put in place in the preceding 14 months were eroded. At this point, there was little understanding from a number of governments in the Union of the complexity and difficulties of the situation. Instead of solidarity – a word to be avoided – there was a greater push for more discipline. This was compounded by a new style of decision- making by France and Germany that avoided in-depth deliberation or technocratic examination, while sidelining the Commission. Once again, in unchartered waters, it was politically easy to put the onus on Greece. As I was battling for consensus between domestic and international political forces on reform intensity and the impact of austerity, I clearly understood and stated from the very beginning that Greece had a problem but was not the problem. What is clear, more than two years after the crisis began, is that Greece is a victim of failings in the design and implementation of the common currency. Over the past two years, the Eurozone has made significant progress in fixing some of the structural flaws. Sadly, it has always been too little, too late. We have reached a make-or-break moment for the Eurozone. We must stop applying patchwork fixes and take immediate steps towards a deeper, more integrated union. We must stop avoiding the real issue, which is not simply to monitor our individual behavior, but to pool our resources as a community and to deal with the crisis at hand. To read the full interview, subscribe or order a copy of The Global Journal.